How to send your first message with Sakari. We've made it super easy for you to get started sending your first message. During your new account setup the account creator was automatically setup as the first contact. To show you how it works, some fake attributes data was added. 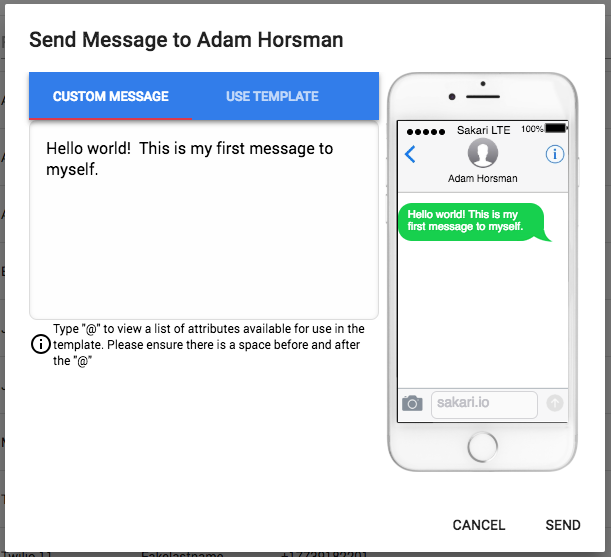 This help document will show you how to send your first text message to yourself. 1.) Click on Contacts in the left navigation. 2.) Click the Message icon to the right of your contact name. 3.) Type your message (or select "Use Template" to use one of the pre-loaded template messages) and click "Send". 4.) You're done! To view the sent message go to the Conversations tab on the left navigation.